The Dodgers thankfully bounced back tonight after two consecutive 1-0 losses to the Giants, finally scoring runs to back Kenta Maeda in a 5-0 win. Everybody can exhale and take it easy for a bit. Let’s start things with Kenta Maeda, who continued the streak of quality outings by Dodgers starting pitching. 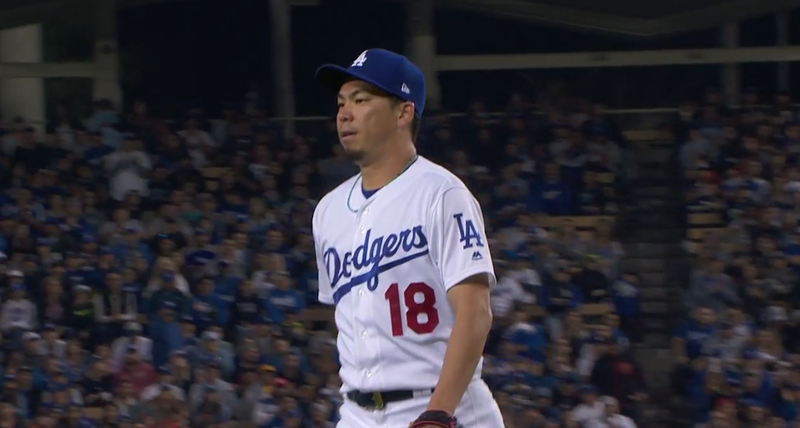 Maeda was sitting 91-93 mph during his outing, which only lasted five innings. Fortunately, that was partially due to how many strikeouts he had, as he racked up 10. Maeda got in some trouble during his 90 pitches, surrendering five hits and a walk, but nothing too serious in his shutout performance. That helped set the stage for the offense, which finally broke out a bit. The bats got off early, as Chris Taylor led the game off with a walk and then Enrique Hernandez followed with a double off the wall. That set things up for Yasiel Puig, who hit a liner to center that scored Taylor from third. Then a miracle happened, as Matt Kemp followed with a single to drive in another run. Two in an inning! In the third, the Dodgers extended their lead after a CT3 triple and was scored by an Enrique sac fly to make it 3-0. The next inning is when the offense blew it open a bit … or more accurate, when Gregor Blanco blew it. After Cody Bellinger and Austin Barnes drew walks, Kyle Farmer hit a lazy fly to right-center with two outs that would’ve ended the inning, at least if Blanco caught it. That was more than enough for the bullpen tonight. Ross Stripling took over for Maeda and pitched a scoreless two innings, Pedro Baez got a scoreless eighth, and Scott Alexander walked two but escaped without harm. The trio totaled four innings, allowing four hits, two walks, and only striking out one, but they got the 12 outs. Kyle Farmer is a catcher playing third base and he did this. Joe Davis want to let you know something about Hello Kitty. 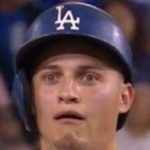 The Dodgers are now 1-2 on the season. Winning is better than losing, IMO. Rich Hill takes the mound for the good guys tomorrow against Chris Stratton.